People who tame wild animals understand this psychology. To get a bird to land, they sit like a stature with seeds in their hand. They do this for hours, days and weeks. Gradually the birds see them as part of the landscape, and will eat out of their hands. I’m like those birds. I distrust the new. For example, I recently got a new dishwasher. Now, dishwashers are my friend. When my old one was dying, I wouldn’t let it go. Not until my children began arriving for dinner with their own silverware and plates. “Do you think they are trying to tell me something?” I asked my husband. Still, when my new one arrived, it was approximately a month before I gained enough confidence to actually put soap in and press the start button. Before that, I watched it. Carefully, cautiously, in case it suddenly struck out at me. But now all is well in my kitchen. 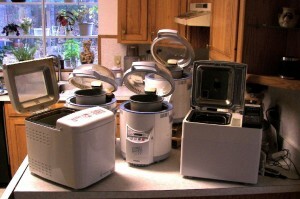 Well, except for the five bread machines sitting on my kitchen counter. Let me explain. I’m part of a worship committee at church. I joined because they told me that they wanted me to write plays and brainstorm. I was excited. “I’m full of great ideas…right lov? I asked brightly. “Oh, you’re definitely full of it…” he replied. So now we go, bi-weekly. We sit in a room and come up with great ideas. Then the other adults on the committee restrain us. At the last meeting, the sermon topic discussed was the miracle of the loaves and fishes. Someone, (I swear it was my husband) suggested that we illustrate this parable by putting bread machines all over the church. Gradually the odor of fresh bread would spread though-out the sanctuary, cumulating during the sermon. Afterwards, we could serve it at coffee hour. This time, oddly enough, none of the adults in the room hit the brakes. They all really liked the idea. I got into it too. There was a long silence, finally broken by the pastor. And it was. The miracle of the bread and fishes, some 2000 years ago, was followed by the modern miracle of the bread machines. I asked, and received. And now, here I am, standing in my own kitchen, staring down proudly at five bread-makers. Yes! I am ready. I can feed the crowd of 5000. But my moment of triumph was short-lived. He was unmoved or worse…amused. The knitting group had even more questions. So now I’m staring woefully at five bread machines. I want to make sure that they don’t move; that they are not dangerous. I’m wondering why I ever told my knitting group about my plans for them. Should I try to escape and run off toward Florida before Sunday? Or should I add sardines to the bread mix and cover the whole fish thing? I’ve realize that I am way, way out of my comfort zone. Staying in your comfort zone narrows your world. Leaving is hard and it takes faith, or prodding…or in this case, both. But I’ve realized, somewhat wryly, I am thankful for it. I want the seeds that are being held out for me, if I just have the faith and courage to land. And perhaps that’s been the true miracle of the bread machines. Congrats on making it through the whole ordeal, Although i think more testing should have gone on as i only sampled one type of bread. I really enjoyed this tale, and totally agree with the sentiment behind it about getting out of your comfort zone. But that aside, I just think the whole idea of a ‘scratch and sniff’ sermon is wonderful. So glad it went well for you!